Nearest fuel: Dwellingup 15 km north from the start of the track & Waroona 22 km west from the track. Size: Lane Poole Reserve covers an area of more than 54,000 hectares. 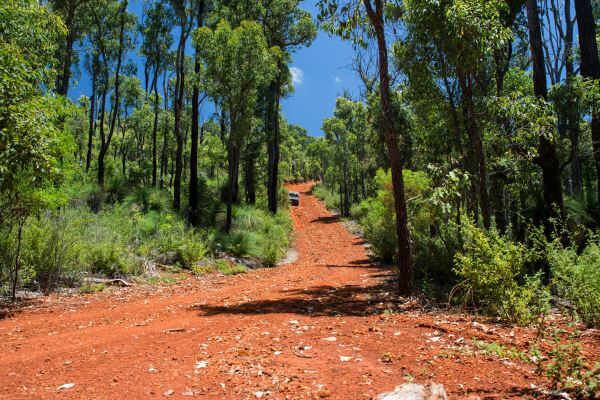 Track length is 69 km in total (gravel roads and bush tracks), snaking south along the western side of the Murray river then crossing the Murray heading north on the eastern side to "Tony’s Bend", camp sites, water fall and a big open area of river to swim in. Perfect for either a day trip or an overnighter at any of the DEC camp sites. The track took us from 9:30 am - 4:00 pm to complete (only 2 4x4's), this included stopping at many of the locations along the river (too many to see all), we also spent a good hour and a half at the water falls relaxing with my camera and a few cold ones. 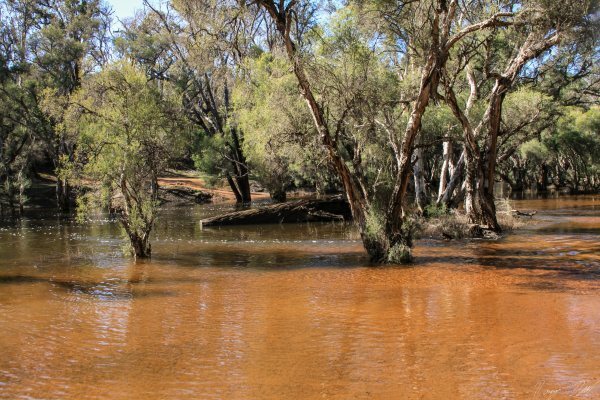 Just south of Dwellingup is Lane Poole Reserve, this area has plenty of camp sites with facilities and right through the middle of Lane Poole Reserve is the Murray river stretching from north to south. 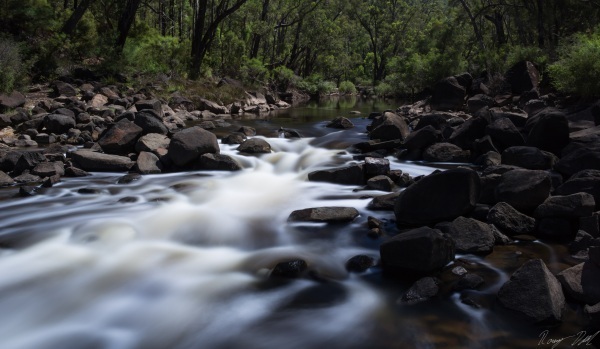 The river is the main attraction as it flows strong all year round and has big wide open areas which are great for swimming, canoeing and rafting in winter. This track we have outlined and explored is good fun in summer but would be 10 times better in winter. We drove the tracks in summer (JAN summer of 2013) and it was still muddy in areas. Our last trip here was July 2013 and as you can see on some of the photos very wet. Deep ruts appeared to be common along the way with a few holes which would turn into bog holes in winter and plenty of steep hill climbs/descents. 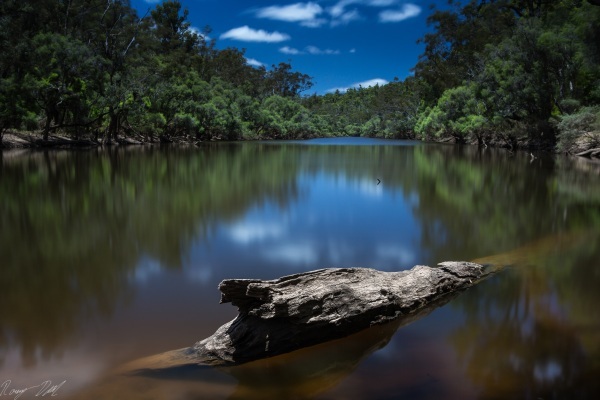 The track we outlined starts on the western side of the Murray River and actually continues out of Lane Poole Reserve into Dwellingup State Forest, crossing the Murray River and then renters Lane Poole Reserve on the eastern side of the Murray River. 4 wheel drives with at least 2 inch lifts would be recommended for this track. Ruts are quite common along the track. Western side of the Murray river. 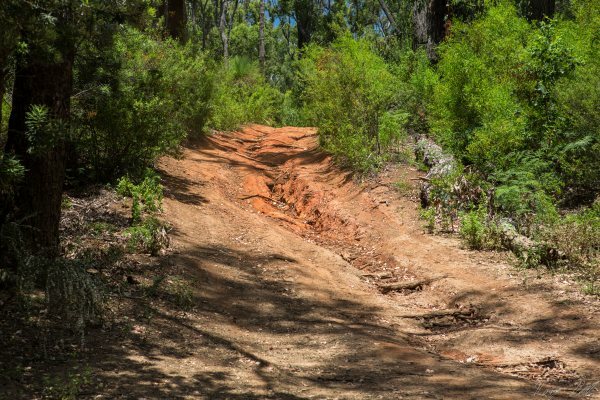 As the track snakes along the Murray heading south, multiple little turn offs on the left hand side lead down to the river, most of these little access roads are very, very steep and usually rutted out. Take good care in winter if entering one as it will be real easy for a 4WD to end up "upside down". Some of these have river ropes for swinging into the river, we didn't try these and would not recommended using them without checking what lays beneath the water, also keep in mind the river will be shallower in summer. In other words "use at own risk". These little spots along the river are great for stopping and relaxing for a bit or perhaps lunch. Just make sure no rubbish is left behind. Keeping left at every Y junction will keep you on track to the Murray River crossing. See bottom for detailed GPS points (enter them in Google maps). Murray River Crossing, Dwellingup State Forest (Mid-point). Murray River Crossing in Summer crossing from East to West. This is the half way mark! If in spring summer "it's a piece of cake" to cross, more than likely just knee height water levels. However!! If its winter and a fair amount of rain have fallen the thought of crossing the river will worry most people and you really can't blame them. 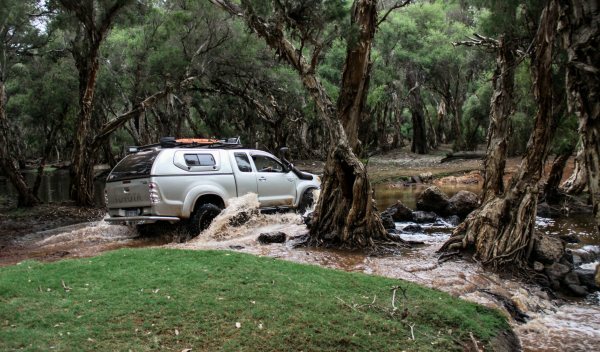 We crossed this exact spot in winter of 2010 (not the wettest year I might add) and the top of my snorkel was only about 200 mm from the water at the deepest point! IF YOU CAN'T WALK IT DON'T CROSS IT!! IF you’re NOT SURE and have never done it before DON'T CROSS IT!! If you see someone else cross it pick the same line, now this won't always work, especially if the 4x4 before you had a massive lift and massive tires in other words very different setup, but you should get the idea. What it does have going for it is the solid river bed, it's all hard packed gravel and rocks with very little sand. Large rocks along the north side of the crossing and a wide tree should keep the vehicle from drifting down stream if it goes pear shaped, but this is only theory. If you do cross it while it’s deep you will have adrenalin pumping through your veins for sure! It’s an awesome feeling once you make it across!! Murray River Crossing in Winter. Eastern side of the Murray River. Once over the east side Murray river head north along Pascoe rd. and take the second left at Lemercier rd, from here just keep heading north until the T junction at Murray rd. Turn left onto Murray rd and continue north, when you hit the intersection at Howse drive you will have 2 choices. Keep heading north to the exit or to Tony’s bend camping area and Nanga Falls. 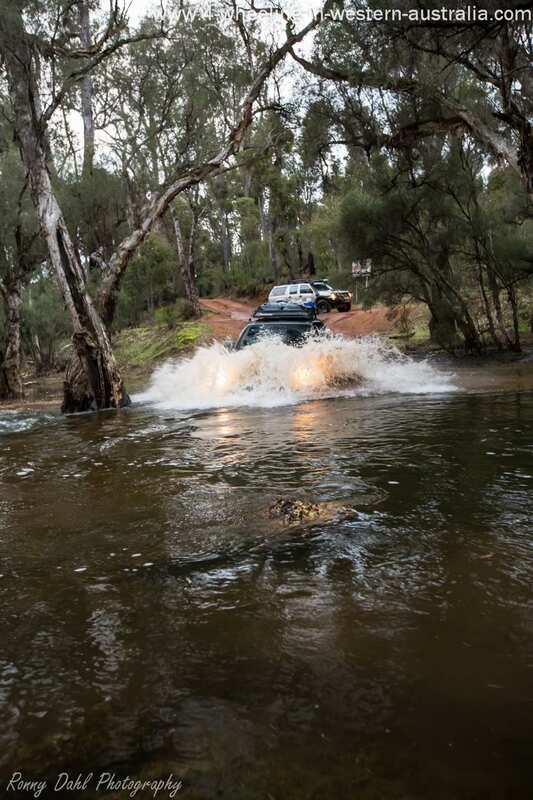 Head west on Howse rd and turn right (north) before the bridge and follow the Murray River in a north direction, this area is unexplored by us for now, (stay turned for later this year after a winter trip) there is sure to be some great challenges to be had! If you choose this option by checking Google maps you will be able to see Allen rd. Allen rd will get you back to Murray rd. Heading north (1st choice) along Murray road for about 12.3 km turn left onto Wallace road (or keep going north on Murray rd for the highway exit close to Dwellingup), this will take you to Tony’s bend camp site and Nanga Falls. Before you get to the camp sites there are a few challengers on the left hand side half way in. You won't miss them! They are big hill climb challengers at the pine plantations. Good fun in summer (heart pumping stuff), in winter unless equipped with lockers front and rear with a bit of dare devil enthusiasm I wouldn't recommend trying! Water cascading at Island pool. Continuing to Tony’s bend, Island Pool and Nanga falls which are great in summer for a swim or canoe, the water falls/cascades (2 of) should look very spectacular in winter after big down pours. Easy- Medium in summer, Medium-Hard in winter. The gravel roads are well maintained; the tracks are rutted and have gullies along the way with the odd creek crossing. Low range and high range gear is used about half each as sections in between are smooth, but don't let this fool you as around the next corner there will be a gully or set of ruts waiting for you! Recommended psi is 22-25 this allows most 4x4s to travel up to about 60-70 on the gravel roads and still provides great traction on the tracks. Please see the river crossing page on our site before attempting to cross any rivers. In winter travel with at least one other vehicle! Nissan Patrol In Mud Barrel. Things to do at Dwellingup. Air compressor, rated recovery gear, shovel, garden saw or machete, sunscreen, bush hat, plenty of water and CB radios (no phone coverage for most of the track). Camping gear, if staying overnight or the weekend. Winter for a more action pack 4 wheeling weekend! Toyota Hilux Descending A Steep Hill. Pathfinder Descending One of Many Hills. So the river is too deep! no need to worry just head further south until you reach Harvey-Quindanning rd, this will take you to straight to Harvey & the South Western Highway. 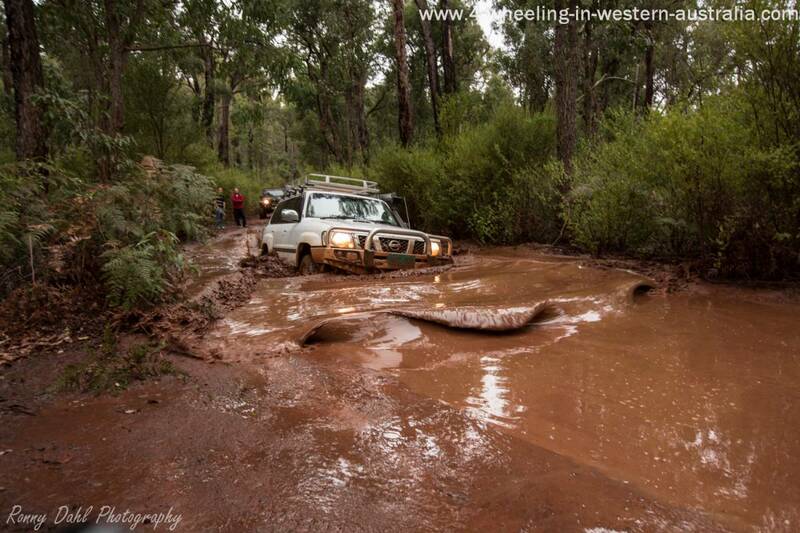 Leave Dwellingup And Go 4 Wheeling In Western Australia. 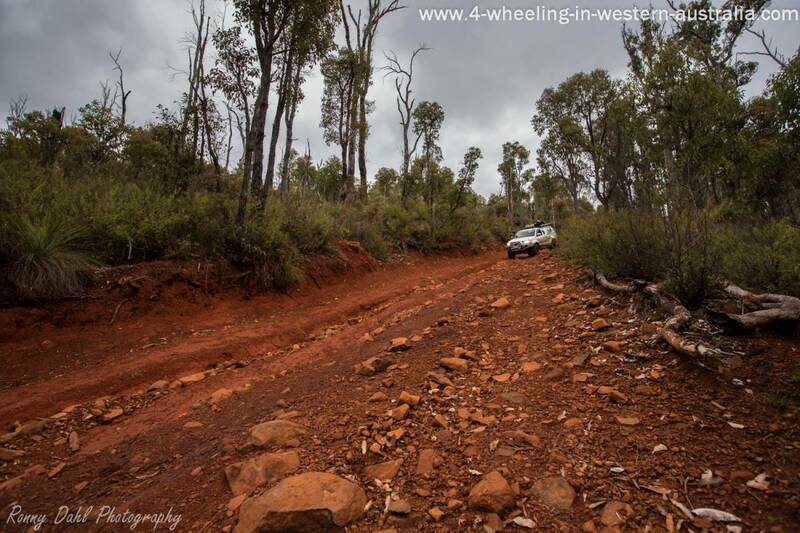 Leave Dwellingup And Go To Off Road Tracks Within 300 km From Perth.